This custom-made 80 tons C-frame press consist of a rigid structure with a slotted upper table driven by the main cylinder, four lateral guides and a slotted, removable lower table with a lower cylinder (15 tons) that acts as an ejector. 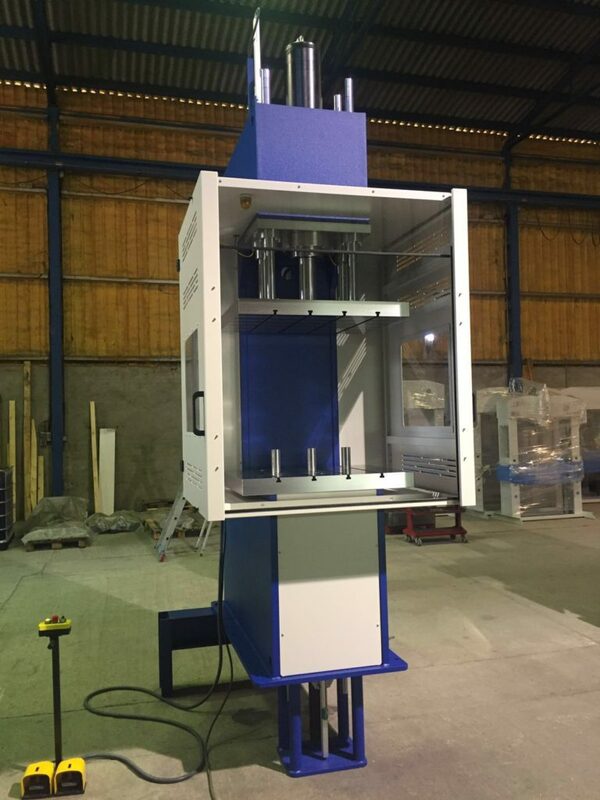 This special C-frame press is designed with an extra large cylinder stroke and vertical light in order to meet the requirements of the customer. The regulation of the pressure and the regulation of the stroke of the main cylinder and ejector cylinder is performed by the Siemens programming screen placed at the control panel. With this NC control it is also possible to save 99 different working cycles. Made in Europe, with solely European components and fully designed to the wishes of the customer.